We have a new addition to the farm. 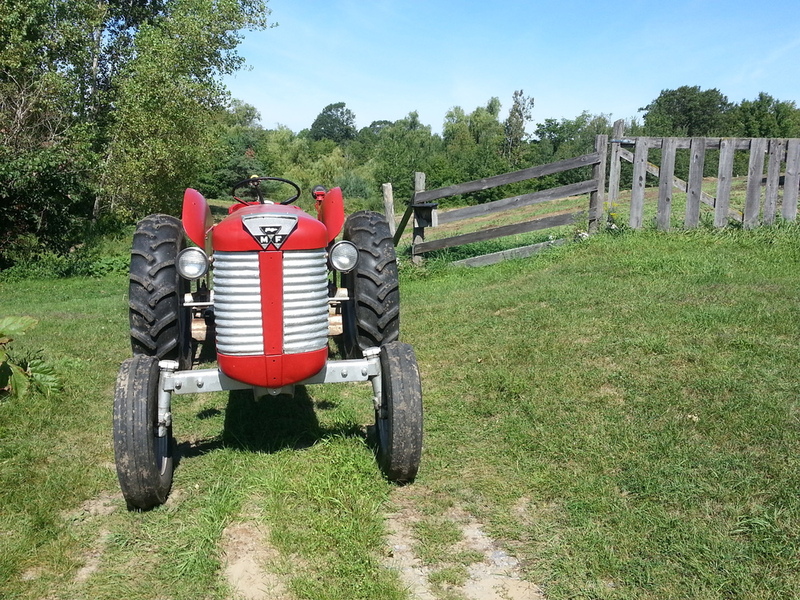 I've been asked "why do you need a tractor" and I can't think of legitimate reason beyond I want one! We have two attachments for it. One is a box blade and the other is a Bush Hog mower. The plan is to use the blade to level the pasture behind the house so we can turn it into an Orchard. The Bush Hog will be used to clear some additional land before mother nature completely takes over. There are several areas which are covered in tall grass with some sumac. It does not take long before it is so over grown that it is difficult to even walk through. Below are some action shots of the blade in use. This all started with a Bobcat (before we had the tractor) which was used to take out some stumps, rocks and to shape the land. The tractor was then used to level the field and to make the slope a little more gradual so that it can be mowed with the riding mower. When I was mowing I got a little over zealous and started into the lower corner of the property. This is not an area that we have explored much because it is very wet but when I was on the tractor it appeared surprisingly dry. However there was a lesson to be learnt... when you are mowing and start to see bullrushes it's a good idea to turn around. This turned out to be quite a dilemma. The tractor, as you can see, was buried right to the axle. Susan came out to assist and we had to put our heads together to solve this one. The first attempt was to pull it out with the truck but we could not get close enough without getting 2 vehicles stuck. We then put some blocks of wood under the tires but that was useless as the bog is very deep and the blocks were just pushed down into the abyss. Finally the solution came to us, and it was pretty simple. We chained a 4x4 post to the tire putting the chain through the rim so the post had to turn with the tire. After locking the rear differential the tractor just drove right out of the hole.